Sean Dyche was frustrated with the 94-second spell which ultimately cost his side one of the FA Cup shocks of the round. Burnley led at half-time at the Etihad Stadium thanks to Ashley Barnes’ thumping strike after 25 minutes. The Clarets frustrated all-conquering Manchester City - unbeaten domestically this season - but two Sergio Aguero goals in under two minutes just after the break changed the course of the tie, as Pep Guardiola’s side ran out 4-1 winners, with further strikes from Leroy Sane and Bernardo Silva. Dyche said: “That can happen here, that was really my only overriding gripe with the team, because I thought we were very good up until their first goal. “It was a bit of a contentious one, I spoke to the referee and he said he doesn’t have to blow the whistle, but I think when Ashley Westwood is five yards away motioning to say ‘are you going to blow the whistle?’ and he is the man who would be in the slot where they pass it to, I’m bound to be aggrieved. “But the next minute and a half was my biggest gripe. We looked a bit punch drunk, we didn’t clear our lines on two occasions, our shape went a little bit, and teams like this have the power to almost smell that moment, and then pick up their tempo. “They did, and scored the second. “Then we had to go for it, there’s no point, it’s the FA Cup. Dyche and assistant Ian Woan had what looked a heated discussion with Guardiola after the first goal after a quickly-taken Ilkay Gundogan free kick, but Dyche laughed that off: “No, not really, you both fights you both want to win, you both want your teams to win, that’s just how it should be. 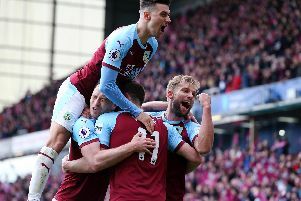 Both sides made four changes, fewer than anticipated after a hectic Festive schedule, and Dyche noted: “I don’t know their thinking, but it could be seen as a sign of respect, it could be a sign they definitely want to get the job done, either or, they won, and that’s their job. And Dyche accepts the focus and concentration at places like this has to continue to develop to grow further: “I think there’s nothing they don’t know, you’ve just got to stay focused all the time. “Especially against teams like this. It can be flat, it can be quiet, and then three, four passes, three, four movements, and suddenly it’s a goal. “The higher up our learning, it’s that constant concentration and focus. “But the biggest thing though, we’re at the end of our squad at the moment, but the mentality...you’d never have smelt that. “56 minutes in, you’d have been looking at our team thinking ‘that’s a team that plays together, that knows how they play, that are organised. “That’s really pleasing for me and my coaches. “When your team is at its most stretched, and yet they are operating how a team should, or how I think it should look, so I’m very pleased with that.